J.D. McDuffie’s first start at the Martinsville Speedway came on September 22, 1963. At the time, the Sanford driver was a 24-year-old rookie making just his ninth series start. He was driving his own car, a two-year-old Ford acquired from another team, and carried car #76 in place of his familiar #70. Despite the car’s age, McDuffie parlayed his short track experience into a 26th-place qualifying run in the 36-car field, then fell out after 82 laps with hub failure. Martinsville proved to be one of McDuffie’s most challenging tracks. In 40 starts there, McDuffie failed to finish 22 times and scored three last-place finishes. The first of those three occurred on September 26, 1971, when his 1969 Mercury broke the rear end after 58 laps of the Old Dominion 500. The race was won by defending series champion Bobby Isaac. The second occurred on September 28, 1975, when his #70 Butler’s Chevrolet blew an engine after 18 laps. That race saw a first-time winner take the checkered flag – Dave Marcis – who had taken the place of Bobby Isaac in the #71 K&K Insurance Dodge. In time, Marcis would field the #71 himself, becoming another of NASCAR’s ageless owner-drivers. The third last-place finish didn’t take place until April 26, 1987, a footnote to Dale Earnhardt’s victory in the Sovran Bank 500. McDuffie started 27th in the 31-car field, but his unsponsored Pontiac lost an engine after 21 laps. McDuffie also participated in at least one qualifying race held at Martinsville. In the late 1960s, heat races were by no means limited to the Daytona 500, but also included the July race at Daytona, Darlington, Charlotte, and Rockingham, among others. Martinsville hosted a 50-lap qualifier on September 27, 1969. The race included the 24 entrants who failed to qualify inside the Top 20 for the 40-car starting grid, meaning that the lowest four finishers would miss the show. Unable to qualify his own #70, McDuffie picked up a ride with Dr. Don Tarr, a Florida physician turned race car driver. McDuffie qualified Tarr’s #0 Chevrolet 7th for the qualifier and finished 5th, more than enough to start Sunday’s race in 25th. Unfortunately, he finished 36th in the main event with a blown engine. 1969 was one of just two occasions where McDuffie drove for another team owner at Martinsville. On October 17, 1982, he after again failing to qualify his #70, Cecil Gordon had him take his place in the #24 Buick. McDuffie ended up turning in one of his best runs at the track that day, climbing from 30th on the grid to finish 15th, 78 laps behind race winner Darrell Waltrip. Though McDuffie never led any of the 11,839 laps he completed at Martinsville, he did score five Top Tens. His track-best were a pair of 9th-place runs. The former, held on April 28, 1974, was dominated by Cale Yarborough, who led 360 circuits and lapped every driver except runner-up Richard Petty. The other, on April 24, 1977, was another trouncing by Yarborough and the Junior Johnson-led team, pacing 243 of 384 laps in a rain-shortened event. McDuffie’s best overall performance at the track came two years later, when he started 10th and finished there, seven laps down. That same day, Richard Petty scored his 15th and final Martinsville win. 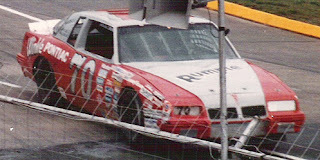 McDuffie’s final green flag at Martinsville came on September 27, 1987. That day, his Rumple Furniture Pontiac lined up 27th in the 31-car field and managed to climb up to 17th by the checkered flag, 42 laps down. Among the drivers who finished behind him were polesitter Geoffrey Bodine, Ricky Rudd, Benny Parsons, Rusty Wallace, and last-place finisher Buddy Baker, out with brake trouble. Darrell Waltrip took the win that day, his first in Rick Hendrick’s Tide-sponsored Chevrolet. McDuffie attempted to make four more Martinsville races, one each year through his final season in 1991, but failed to qualify each time. Regardless, his career total of 40 Martinsville starts ranks high in series history, ahead of such drivers as Buddy Baker (39), Matt Kenseth (36), Tony Stewart (34), and David Pearson (28), and just four fewer than Bobby Allison and Dale Earnhardt (44).